In the early 1980s, Francis Ford Coppola visited Belize, immediately fell in love with the location, and purchased the abandoned Blancaneaux Lodge. For more than a decade the resort was used as a family retreat before Francis opened his tropical paradise to the public in 1993. 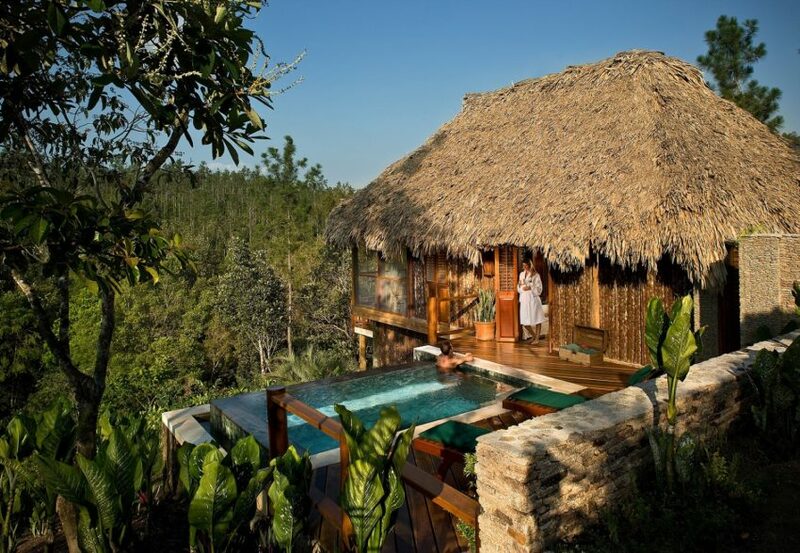 Tucked away in a pocket of the Maya Mountains, Blancaneaux Lodge is a 20-room luxury resort where waterfalls tumble into turquoise pools above the jungle canopy. Its remote mountain setting makes it a perfect place to relax, rejuvenate and enjoy life’s simple pleasures. Guests can also explore the ancient civilization of the Maya, which still endures in the sacred sites throughout this magical region. From the ceremonial caves along the white-water rivers of the Mountain Pine Ridge Reserve to stalactite caverns and the vast ruins of Caracol deep within the lush rainforest’s, Blancaneaux is your window into the world of natural and archaeological wonders. Nestled in our beautifully manicured gardens, the comfortable Garden Cabañas showcase native arts and antiques, plus a large screened-in porch with hammock. 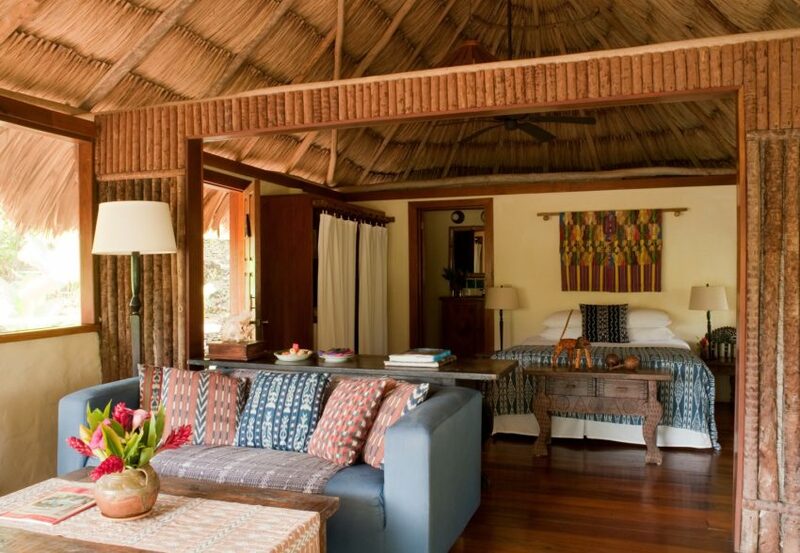 Family Cabanas A large dining table, queen-size bed, and a pair of twin beds highlight this spacious Family Cabaña. A large screened-in porch overlooks our beautiful gardens, which can also be enjoyed while idly swaying in the room’s hammock. 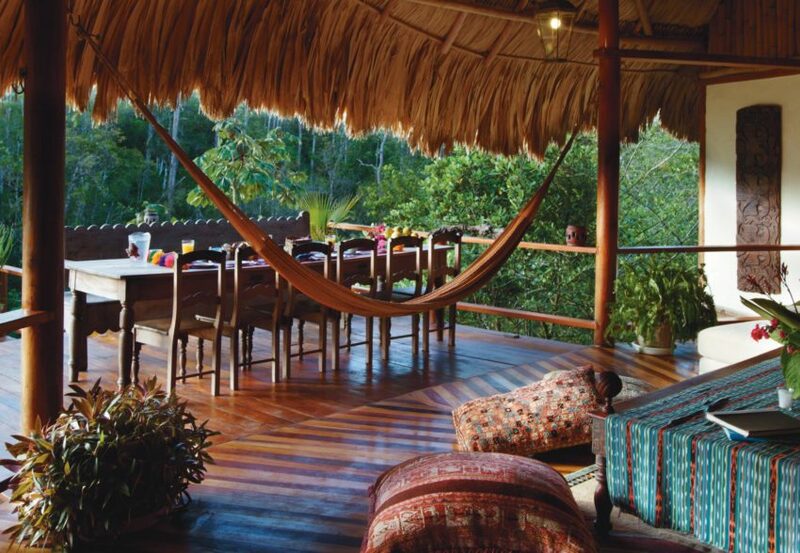 An expansive deck with wrap-around walkway ensures a spectacular view of the Privassion River. Elegantly themed with nature art and local textiles, each cabana offers a queen-size and hand-painted tile bath. 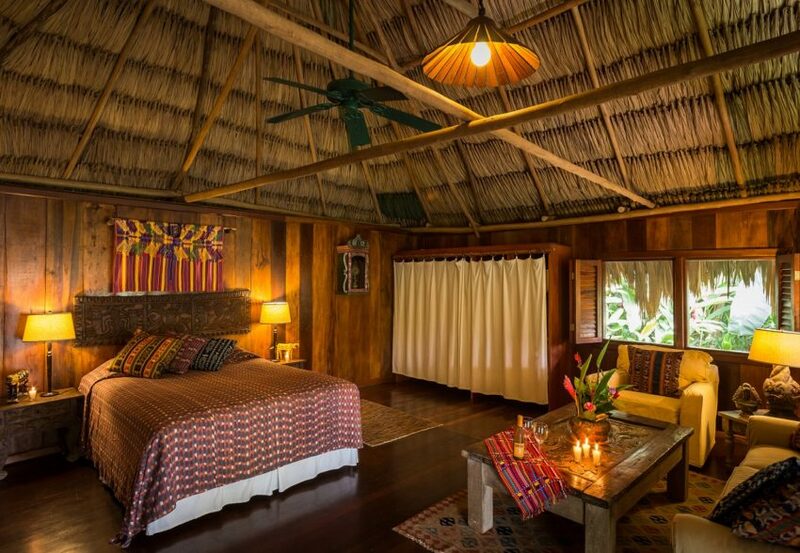 Since we opened the Deluxe Cabañas in early 2008, they have quickly become the most sought after accommodations on the property. Surrounded by lush vegetation and just a stone’s throw from deep pools and tumbling waterfalls, the two Deluxe Cabañas offer a secluded setting at the far eastern end of the property overlooking Privassion Creek. Skirting Privassion Creek, the roomy 1,600 square foot villas feature a large comfortable open-air living room with a small kitchen. Off the living room are two luxurious bedrooms, each with its own full bath. Enjoy dramatic views from the elevated open-plan living area, take a dip in the private plunge pool or relax on the hardwood sun deck set in a lush tropical garden. The Villa features a small kitchen with Delonghi espresso machine, fridge and wet bar. A hand carved antique dining table with seating for up to 14 overlooks the tumbling waterfalls and deep rock pools of Privassion Creek. Accommodations include two large bedrooms each with a spacious bathroom featuring showers with hand-painted tiles and Japanese tub. The eclectically furnished Villas combine regional antiques, Guatemalan fabrics, artisan masks and hand carved figurines’. Francis’s personal art and antiques are displayed throughout adding a personal touch to an already comfortable and stylish environment. Blancaneaux Lodge’s ultimate retreat. 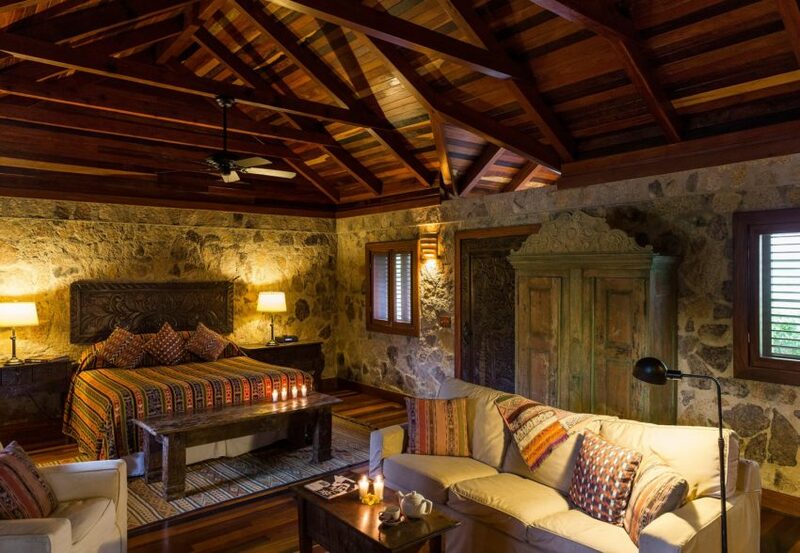 Reflecting Francis’s desire to create a haven to reflect, write and create, the cottage sits atop a steep forested bluff offering panoramic views over the tumbling waterfalls of Privassion Creek and the distant jungle clad Maya Mountains. With an emphasis on luxury, the cottage features a bedroom with a king-size bed, writing desk and fireplace. The bath house provides understated luxury with its under floor heating, open fire, shower, Japanese tub and steam room. The cottage has a spacious kitchen that includes a wine cooler, Delonghi espresso machine, a breakfast bar and a heated slate floor. Adjacent to the kitchen is an airy day room with queen-size sofa bed, large coffee table and comfortable armchair. Screened doors open onto the hardwood deck and the infinity pool. 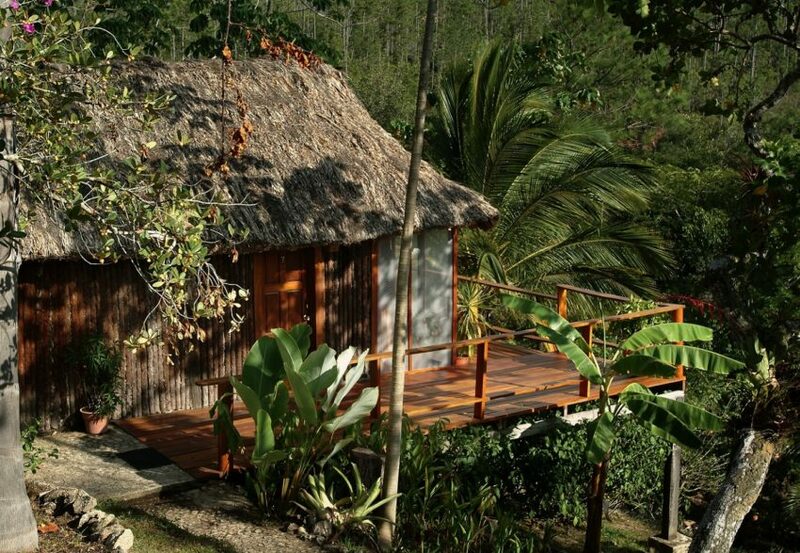 The Enchanted Cottage is secluded and surrounded by lush tropical gardens and spectacular panoramic views. There’s a hammock for lazy afternoons. Guest at the cottage enjoy monogrammed bathrobes and wine glasses, locally produces organic bath products, goose down or hypo-allergenic pillows, iPod docking station, WiFi internet access and a Shellphone intercom system linked to the resort’s front desk. The cottage also includes a full-time attendant to light fires, cook breakfast, prepare cocktails and anticipate your every need. The attendant is on-call using a walkie-talkie radio system. Guest are provided a robust four-seat golf cart for driving around the property and visiting the main lodge and restaurants.